Under multiple stimuli, M&A activity in 2017 is off to an exceptionally strong start. In fact, January’s M&A activity was the highest since 2000. Almost 4,700 individual transactions were announced. Spurred by a global positive sentiment, increased credit availability, and pent-up demand from 2016, companies sprang into action in January with the goal of getting deals closed quickly. In excess of US$270 billion in worldwide mergers and acquisitions were announced in the month of January, which was an increase of 30% from the US$207 billion announced in January of 2016. The M&A activity of early 2017 was bolstered by the healthcare and energy sectors. The value of healthcare transactions totaled US$58 billion, and was led by Johnson & Johnson’s US$29 billion acquisition of Actelion Ltd and Mars Inc.’s US$9.1 billion’s acquisition of VCA Inc. The Johnson & Johnson - Actelion deal ranked as Johnson & Johnson’s largest-ever acquisition and the third largest ever U.S. acquisition of a foreign company. The top energy sector M&A deal announced in January was DCP Midstream Operating, LP’s US$8.86 billion acquisition of substantially all of the remaining assets of DCP Midstream LLC including assumed liabilities. Mergers and acquisitions in the technology, media and telecommunications (TMT) sector will continue to soar in 2017 due to a number of significant factors. Companies in a wide array of industries including retail, manufacturing, and financial services will use M&A as a tool to improve efficiency in business processes, increase protection against cyber attacks, manage and analyze data better, etc. This trend will translate into an increasing value of tech companies from an M&A perspective. Valuations will also be driven up as strategic buyers and private equity firms race to compete for the best technology targets. Versailles Group is a 30-year-old boutique investment bank that specializes in international mergers, acquisitions, and divestitures. Versailles Group’s skill, flexibility, and experience have enabled it to successfully close M&A transactions for companies with revenues greater than US$2 million. 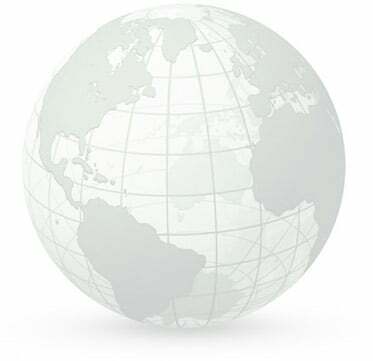 Versailles Group has closed transactions in all economic environments, literally around the world. Versailles Group provides clients with both buy-side and sell-side M&A services, and has been completing cross-border transactions since its founding in 1987. More information on Versailles Group, Ltd. can be found at www.versaillesgroup.com. Founder and President - Versailles Group, Ltd. In 2016, there were 96,665 M&A transactions closed with an aggregate value of US$4,734 billion. In terms of deal value, 2016 was the third best year since 2007, significantly higher than any other year and only slightly surpassed by 2014, the second best year when US$4,802 billion of transactions were completed. That being said, 2016’s M&A activity was definitely lower than 2015. In 2016, the US once again topped the rankings by both volume and value. Specifically in terms of deal value, US$1,617 billion of transactions were closed during the year. Some of this activity can be attributed to the burst of mega deals led by Time Warner’s US$109 billion acquisition by AT&T, which was the largest transaction in the US, the second largest M&A deal globally, and one of the only two global deals worth over US$100 billion during the year. Following the US’ leading position, China was second with a value of US$789 billion. The largest deal by value involving Chinese targets was the transaction between China National Petroleum Corporation and Jinan Diesel Engine in a reverse takeover worth US$11 billion in December. Chinese companies completed ten of the top 20 deals in Asia-Pacific in 2016. The UK was third with US$420 billion of transactions. The largest deal by value in the UK involved Anheuser-Busch InBev’s US$124 billion acquisition of SABMiller, which was also the largest globally. With strong M&A performance in the US, China, UK and other countries combined with an environment that is conducive to M&A, sellers or buyers should have the confidence to embark on a transaction in 2017. Candidly, now is the best time to make plans to complete a transaction in 2017. Sellers should act before buyers/investors’ investment plans and funds have been devoted to other transactions. Buyers should take advantage by identifying the highest quality targets and moving on them quickly to avoid competitive bidding situations. The chart above depicts M&A activity by value. As you will note, 2016 was about 16% lower than 2015 even though it was the third busiest year ever. ► In 2016 private equity firms raised almost US$250 billion for acquisitions, which is now available. ► Large corporates worldwide are still "sitting" on very large amounts of cash that they need to deploy. ► The new US President is expected to make some fundamental changes that will be business friendly. ► Buyers and sellers are expected to take advantage of current market conditions. ► The low growth economy encourages the use of M&A as a tool to grow a company, acquire technology or R&D, etc. ► Interest rates are still low, but are expected to increase over time - motivating buyers to move sooner rather than later. ►Looming economic uncertainty is motivating buyers and sellers to complete transactions. ►Sellers worries about valuations, which were an impediment in 2016, have been alleviated. Now, sellers are becoming worried that if they don't complete a transaction in the near term, they may miss the "window." M&A activity, in 2017, is expected to pick up dramatically for four reasons. First, the strong equity markets are generating optimism as they are usually a leading indicator. Second, in a recent survey, an unprecedented number of business owners or executives claimed they are planning an M&A transaction in the next 12 months. Third, many domestic and European companies have accumulated large cash balances that are available for acquiring new businesses. Fourth, private equity firms are sitting on a record US$1.1 trillion in un-invested capital and are expected to boost the number of completed transactions globally. It’s expected that the North America M&A market will be strong for the next three years, particularly in the US. 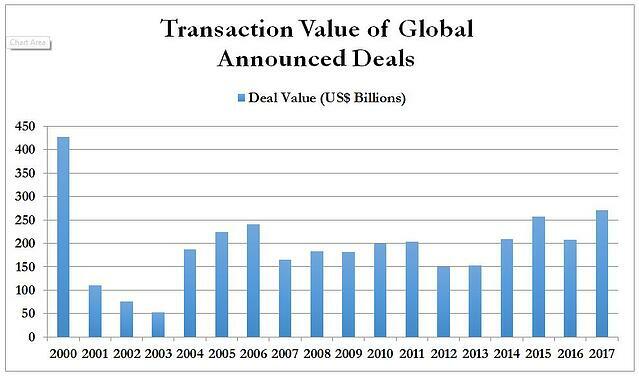 However, M&A transactions in the US will peak at US$1.5 trillion in 2017, which is indicated in the chart below. Logically, sellers should take advantage of 2017’s robust forecast. On a global scale, US$2.7 trillion of M&A transactions were completed in 2015. 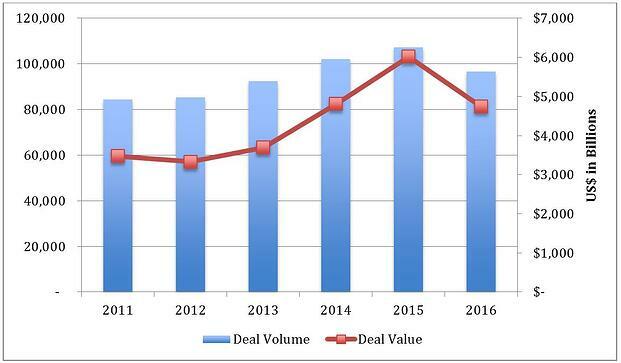 It’s been forecasted that US$3 trillion of M&A transactions will be closed in 2016. In 2017, it’s expected to increase, again, to US$3.4 trillion. With regard to the European market, inbound M&A transactions, by US companies taking advantage of a stronger US dollar, are expected to increase. The UK, Germany and Spain are the most attractive investment destinations, while France and Italy remain less interesting. On the other side of the world, the re-emergence of Asia as one of the world’s most dynamic growth stories is steady and striking. China Yuan’s depreciation and the bursting asset bubble have spurred increasing outbound activities by Chinese buyers into neighboring Asian countries as well as developed countries. At the same time, the Chinese Government is starting to control this outbound activity, which may alter some of this activity. Lastly, the Africa and Middle East markets are worth paying attention to as oil prices rebounded after OPEC announced production cuts. A recovery in oil prices will enable more available funding, which subsequently may boost deal-making activities in the region. Sellers always want to know whether they are being offered a fair value for their company, or if they should just walk away from a potential sale. Typically, one considers general valuation ranges for a business based on multiples of the company’s EBITDA (earnings before interest, taxes, depreciation, and amortization). The multiple will be specific to the type of business being sold and its growth projections. While these multiples may be helpful at first, the true market price of the company is discovered once the bids from perspective buyers are compiled. Clients are often surprised by how close in value the offers are, but it’s because that value range is the market price. Selling a business is a simple example of supply and demand; the buyer’s bids find the equilibrium. When should I accept a bid? Accept a bid that comes in at market price as defined by the offers that are received. One trap that sellers fall into is that after the bids are compiled, they decide their business is worth more. While it is always preferable to receive a higher value, sellers must be realistic and honest with themselves about price. When selling anything, there’s always a maximum value that can be obtained. There is no such thing as a dumb buyer that will pay an outlandish amount. The next key mistake is when the seller decides to hold onto their business, believing that all the potential buyers are wrong about the company’s value. These individuals convince themselves they can keep growing the business and sell it for more in one to three years. Anything can happen in a year or two, and in this scenario M&A is very much like gambling—it’s better to just quit while you’re ahead. Most companies are not going to have high growth rates forever, and eventually the financial projections will not look as promising. Selling a business now while it’s stable is more realistic than expecting a higher value in a few years when the circumstances, including the economy may be very different. And, if there are any “hiccups” with the business, e.g., the loss of a large customer, the business may not even be saleable. The risk of holding is enormous; especially when one considers that most company owners have a majority of their net worth in the business. All in all, if most of the bids are around the same number, it is advisable to accept an offer and move on. Business owners must understand that there is a good chance these bids are the highest value they may ever see for their company. Blockbuster Video and the music CD business are excellent examples of why business owners should act sooner rather than later. Sellers who are not using an M&A advisor should generally be more cautious when accepting a bid. True market value can only be determined by receiving a number of offers or at least testing the market on a worldwide basis. Individuals attempting to do a deal on their own may not be entirely happy with the offers they have received, which may be the result of only having reached out to a limited number of buyers. It’s unlikely that a small pool of prospective buyers would reflect the true market price for a business. If you feel uneasy about the bids and have not had a professional explore all possible options on your behalf, you should strongly consider whether the offer is worth taking. When selling a company, the seller should be confident that he or she has been in touch with every possible buyer and that to the extent possible, an auction has been established. Anything short of that might portray an offer that is below market value. When considering the sale of a business, it is very easy for a business owner to be uncertain or even pessimistic about its value. This is definitely a mistake, particularly because it can cause a potential seller to miss out on possible opportunities. It may be ironic that I founded an M&A boutique firm to help people sell businesses; however, my own father, when I was young, who owned a small chain of variety stores, decided to close the business rather than sell it. He sincerely believed that no buyers would be interested. Mind you, he didn’t test that theory; however, he thought he was right. A business owner should never assume that his or her business is too small to be of interest to a large company. It is important to remember that there is a difference between the financial value as portrayed by the financial statements and the market value. The market value includes more than just how much the company is worth monetarily. It includes the value of intangible assets for example, the customer base, distribution network, location, having a unique service or product, long term and loyal customers, name recognition, etc. These factors go way beyond the balance sheet and income statement. These and other factors always contribute to a company’s value but are not always easily quantifiable. Additionally, just because a company has modest financial results does not mean it will not sell. Buyers will look at the future of the company and make an assessment of its potential. This is especially true when the economy is in a down cycle. It is also important for the seller to accurately analyze the business’ true financial position, marketability, and potential. A good M&A advisor will know how to do this quickly and accurately. For a company with modest financial results, it is important not to oversell the company as buyers may pull out if they feel the current financial results are unsustainable or the revenue and profit projections are unrealistic. When pursuing the sale of a company, one must strike a balance between underselling the company and overselling it and scaring off or losing potential buyers during the sales process. 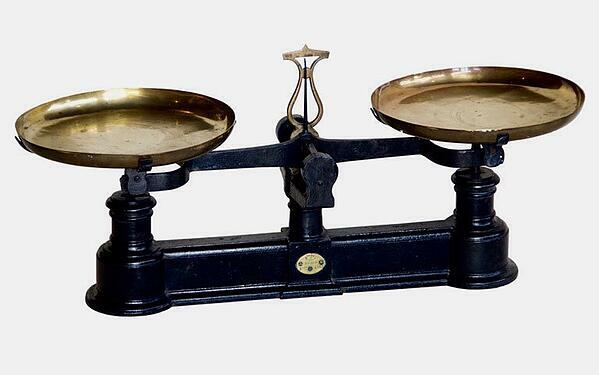 Once again, a good M&A advisor can help strike the necessary balance. The advisor can also provide value-added by finding the “right” buyer who will understand the value and potential of the company for sale. Mergers and acquisitions are an effective and efficient substitute for R&D for companies that need help combating shrinking market share or stagnant growth. In some cases, companies are confronted with fierce competition from startups and utilize M&A as a way to “outsource” R&D and leave the risk of innovation to startups that tend to excel at R&D. Many of these companies are skipping R&D almost entirely by acquiring other companies. This trend is true in almost all industries and many of the transactions are cross-border. 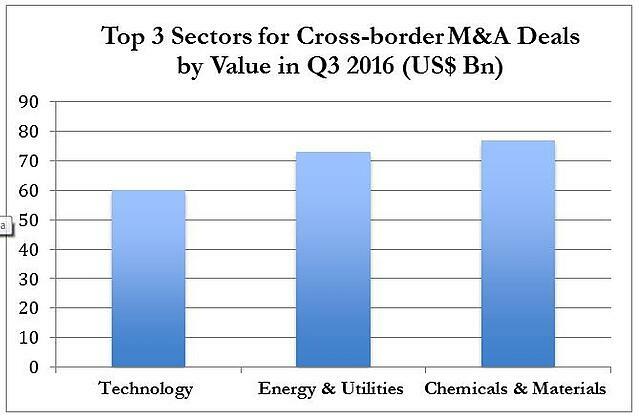 The chart below depicts the top three sectors for cross-border M&A. In recent months, Samsung has been actively involved in M&A deal making as a way to instantly build up its capabilities in emerging technologies such as mobile payments, cloud-based services, and artificial intelligence. Samsung’s planned purchase of U.S. autoparts supplier Harman International Industries Inc. for US$8 billion in an all-cash deal that instantly makes Samsung a major player in the world of automotive technology. It’s an excellent example of a company that is using M&A to expand. This deal will be South Korean smartphone maker’s biggest acquisition in history. M&A in general and cross-border M&A in particular, is a well-proven way to enhance shareholder value, either by acquisitions or divestitures. While most of the press is focused on the large transactions, middle-market companies can also utilize this “tool” to make defensive or offensive acquisitions or divest businesses that no longer fit the company’s strategy. 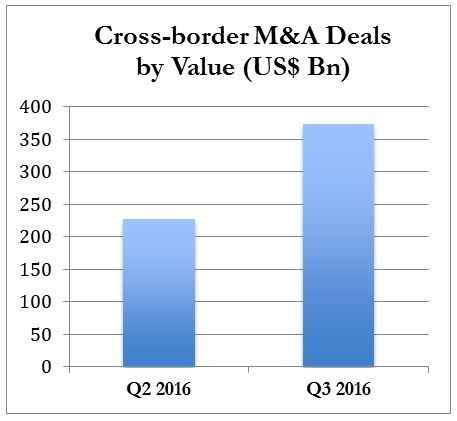 The chart below demonstrates the growth of cross-border M&A deals from Q2 2016 to Q3 2016. Versailles Group is a 30-year-old Boston-based investment bank that specializes in international mergers, acquisitions, and divestitures. Versailles Group’s skill, flexibility, and experience have enabled it to successfully close M&A transactions for companies with revenues greater than US$2 million. 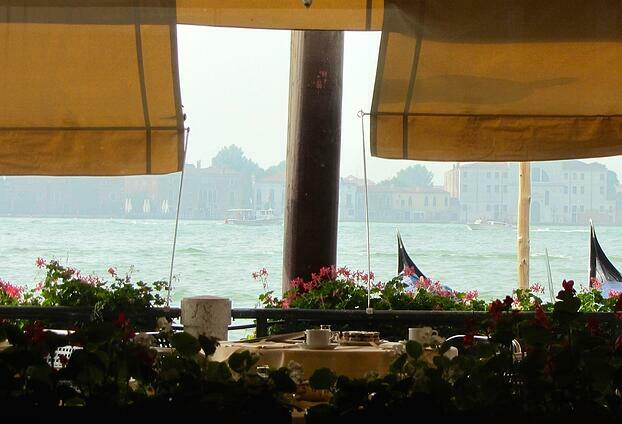 Versailles Group has closed transactions in all economic environments, literally around the world. The US M&A market is on a roll, which is good news for both sellers and buyers in the middle market. A series of high-profile deals announced in October makes it the biggest month ever for M&A transactions and even surpassed the epic deal making surge in January 2000. Mega deals are driving activity and are almost too numerous to count, e.g., the oil-and-gas business combination of General Electric and Baker Hughes, the telecom tie-up of Century Link and Level 3, and AT&T’s acquisition of Time Warner, etc. Another good example in the global semiconductor sector is Qualcomm’s US$47 Billion acquisition of NXP Semiconductors, which notched the biggest semiconductor targeted M&A deal on record globally. So far this year, US$1.6 Trillion of M&A transactions has been announced in the domestic market. It reflects easy financing conditions, more confidence in the economic and business outlook, and keen foresight on the part of management teams. The current economic environment of low interest rates and high stock prices have encouraged deal making. Cheap borrowing costs makes it easy to finance deals, while high stock prices provide companies with higher valuations. With unprecedented economic conditions, owners of middle market businesses, in particular, have a continued incentive to start or keep doing deals. To succeed in the current business environment companies will need to develop a keen sense of agility to grapple with the slow and uncertain economy, political risks, the threat from new entrants with more creative and efficient business models, etc. It is widely recognized by CEOs that to respond to today’s marketplace organic growth is far from enough because most transformational technologies are outside the core competency of the average organization. 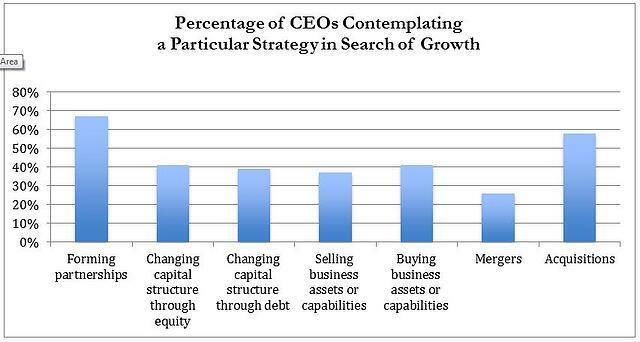 According to KPMG, CEOs are pursuing a range of activities in search of growth, which are listed below. For each activity, the percentage indicates what percentage of CEOs will think about that particular action. M&A, including minority investments, is expected to play a major role as companies search for new and valuable business solutions. Companies that are able to be proactive in terms of technological and business model disruptions will greatly enhance their chances of success, profitability, and longevity. With regard to the US presidential election, and as Warren Buffet said, the market will move forward with either candidate who happens to get elected as President. The country will survive and business will survive. Succinctly, M&A will go on regardless of political uncertainty. Versailles Group is a 30-year-old Boston-based investment bank that specializes in international mergers, acquisitions, and divestitures. Versailles Group’s skill, flexibility, and experience have enabled it to successfully close M&A transactions for companies with revenues between US$2 million and US$250 million. Versailles Group has closed transactions in all economic environments, literally around the world. As one of the BRIC countries, Brazil was projected to continue to be one of the fastest growing economies in the world. However, the 2015 recession in Brazil resulted in a negative growth rate of 3.8%. As a result, Brazil slid from seventh to ninth place in the world economies ranking. Year-to-date, Chinese companies have already purchased US$4 billion of assets in Brazil, the highest level since 2010. According to Bloomberg, the top five countries investing in Brazil are China - 1st, US – 2nd, Norway – 3rd, Mexico 4th, UK – 5th. The Brazilian currency, the Real, has depreciated more than 50%, which has enhanced Chinese and US purchasing power in terms of investment. It’s also important to note that as compared to the US, China has experienced less political resistance when acquiring Brazilian assets. China Investment Corp., which has a US$814 billion sovereign fund, is leading a Chinese investor group that is in talks to complete a multibillion-dollar iron-ore streaming deal with Brazil’s Vale SA. The consortium is negotiating the potential purchase of a portion of Vale’s future iron-ore output for as long as 30 years. Vale could fetch about US$9 billion upfront from the sale. State Grid Corp of China, the world’s largest electricity provider by revenue, is wooing shareholders of Brazil’s CPFL Energia SA and a listed subsidiary. It expects to secure stakes from large shareholders before making an offer for the entire company. The Fosun Group, a major China-based investment group, with operations in several countries, signed an agreement to acquire Rio Bravo Investimentos. Shanghai Pengxin Group Co. purchased control of Brazilian grains trader Fiagril. People familiar with the deal said the value of the deal could be around 1 billion Reais (US$290 million). Shanghai Pengzin, like most foreign buyers would keep current management in place.